The University of Montana Department of Athletics, along with its colleagues in the Sociology Department and the UM Faculty Senate, are mourning the loss of beloved Faculty Athletics Representative Dusten Hollist, who passed away on Sunday, February 10, after a brief, but valiant, battle with cancer. Hollist, 46, served the students of UM as a professor of Sociology and the Chair of the Department of Sociology. In his position as Faculty Athletics Representative, Hollist acted as a liaison between Grizzly Athletics and the University of Montana Faculty. “Dusten was an invaluable member of the athletics department and the university community. His sudden passing has left us shocked and saddened. Dusten was a consistent and tireless advocate for the student-athletes at the University of Montana and within the Big Sky Conference. I will miss him both professionally and personally and the athletic department joins together in support of Cheri, Mariah, and Tristen,” said director of athletics Kent Haslam. A native of Idaho, Hollist earned a bachelor of arts degree at Montana in Sociology in 1997 and a Master’s in Sociology in 1999 before beginning his teaching career at UM a short time later in 2003. He was appointed to the NCAA-required position of Faculty Athletics Representative in 2013 by former President Royce Engstrom. As he would with each program, every year Hollist would introduce himself to the Grizzly football team at its first meeting of fall camp. Upperclassmen knew his speech well, but for new players, it was immediately evident how much he cared for the University of Montana and how much pride he took in being a part of Grizzly Athletics. “I feel so honored to have had the opportunity to work with, and get to know Dusten over the past six years. I especially enjoyed listening to him speak to the student-athletes. His passion for Grizzly Athletics, UM and Missoula was just so contagious. He was an incredibly genuine person and someone that I personally looked up to as a mentor and as a friend. There is no doubt that his passing has left a gigantic hole in the Grizzly Athletics family,” said senior associate athletic director Jean Gee. 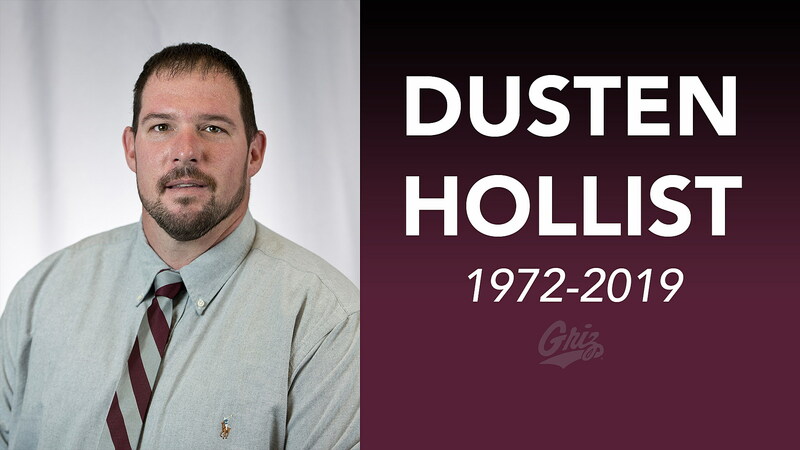 Hollist is survived by his wife Cheri, a Montana graduate and former employee in the UM business services department, their son Tristen, a senior in UM’s fine arts program, and their daughter Mariah, who recently graduated from MSU. A memorial service for Hollist is set for Friday, Feb. 15, fittingly in the UC Ballroom on the campus he loved so much.